cocopa portable ultra-thin external CD DVD drive. Support Mac, PC, Ultrabook and Netbook etc. We use the latest version of the SATA interface DVD RW movement. 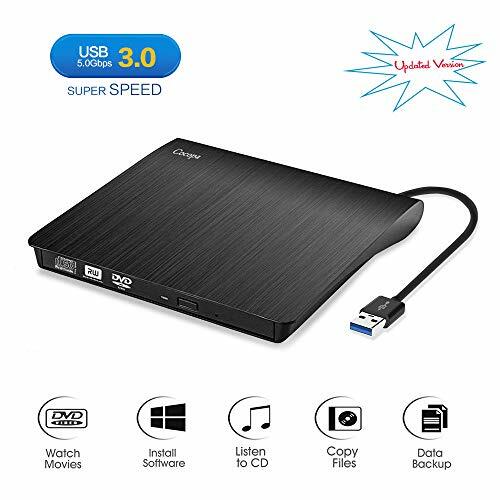 With the advantages of high quality, High compatibility, high performance, strong stability, high Speed, our external CD DVD drive wins customers' Approval. Meanwhile, it has embedded unique burn prevention control chip, which can effectively prevent breaking the disk and gets super read disk error correction function while burning. This item can help to back up your data and enjoy the high-fidelity sound quality DVD and CD which is burnt from our external CD DVD drive. It can read CD, DVD, VCR and other formats disks. 4. cocopa external CD drive supports to read CD, VCD, SVCD, CD-R, CD-RW, DVD-R/DVD-RW and write CD-RW, CD+RW, DVD-RW, DVD+RW etc.